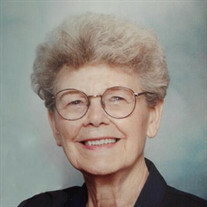 Velma B. Denton, 87, of Vandalia, Illinois, formerly of Ramsey, IL, passed away Friday, July 13, 2018, at Fayette County Hospital, Long Term Care in Vandalia, IL. Private Graveside Services will be held at 11:00 AM, Saturday, July 21, 2018, at Mt. Carmel Cemetery, Rural Ramsey, IL, with Rev. Joe Lawson, officiating. Memorials: Mt. Carmel Baptist Church, Rural Ramsey, IL. Miller Funeral Home, Ramsey, IL is in charge of arrangements. Online memories and condolences may be shared with the family at www. millerfh.net. Survived by: Husband - Donald Morris Denton, Vandalia, IL; Sons - Michael Denton & Christine, Pana, IL, Mark Denton & Rose, Ramsey, IL and Merle Denton & Amy, Brownstown, IL; Daughter - Connie Meyer & Rich, St. Charles, MO; Brother - Rev. Richard Hill, Gillespie, IL; Sisters - LeVeda Martin, Ramsey, IL, Virginia Wayne, Fillmore, IL, Joyce Walker & Scott, Irving, IL, and Mary Applegate, Fillmore, IL; 12 Grandchildren; Several Great Grandchildren; 1 Great Great Grandchild. Preceded in death by: Parents, 3 Brothers; Lloyd, Art Dean and Rev. Ronald Hill; 2 Great Grandchildren - Anthony Workman, 2015 and Payge Donaldson, 2016.